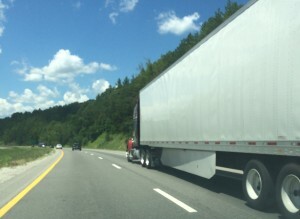 One of the most commonly ignored truck rules is the requirement to keep records of how long truckers have been behind the wheel on a given day. Federal law requires truckers to rest for a certain amount of time, for safety reasons, and to keep a log of where they traveled and how long they were gone. Those truck rules have been in effect since 1938 – nearly 80 years. Those rules are pretty easy for truckers and the companies they work for to bend, though. They can easily write down whatever they want, if they’re not honest, or keep two sets of log books, one that’s accurate and one that’s only to show if asked by authorities. We’ve written about this issue before on our blog. See our July 23, 2015 post on this same topic. The log books come into play in lawsuits involving big rigs. If a truck driver was on the road for too long, or didn’t take the required breaks, it may mean the driver was fatigued or had road rage from driving too long and that caused an accident. If nothing else, the driver is guilty of breaking the law. Large trucks are in accidents fairly often, and when they are, the accidents can be devastating for those in what is usually a much smaller, lighter weight vehicle. New rules require truck drivers to install and use electronic logs that will keep track of when the vehicle started moving, when it came to a stop and for how long and the distance covered. Trucking industry groups have protested the rules change, arguing that less reputable trucking companies will push drivers past fatigue to keep driving if they haven’t hit the limit yet, and that the installation and use of the monitors is an unfair burden on small companies. The Federal Motor Carrier Safety Administration says the changes are going into effect anyway. Congress ordered the Traffic Safety Administration to pursue the change 20 years ago, and due to objections from the trucking industry, it wasn’t implemented until now. If you need a reason why, here’s the best one there is: it will save lives. The Safety Administration estimates the electronic devices will save 26 lives per year and prevent 562 injuries. And it will save $1 billion in costs of keeping up with paper logs. If you’re injured in a tractor-trailer accident, talk to an attorney. The trucking companies will be well-represented, and you should be, too. Call me, Kyle Roby, at (270) 781-6500, at English, Lucas, Priest and Owsley, LLP, or e-mail me at kroby@elpolaw.com. The initial consultation is free.